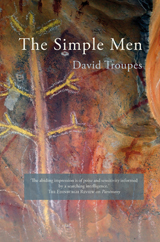 The Simple Men is the second full collection of poetry from David Troupes, an American poet living in West Yorkshire. He applies an assured, eccentric craftsmanship to innovative forms and ambitious insights. The poems of The Simple Men range over hills and down rivers, through truck stop diners and wedding parties, renewing at every turn our relationship with land, love and the self. This entry was posted in Books on March 2, 2012 by Paul Scraton.